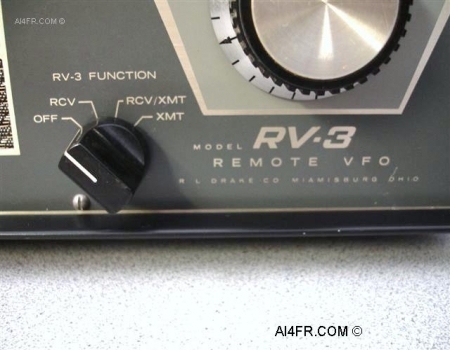 The Drake RV-3 is a remote VFO designed for use with Drake transceivers. The RV-3 consists of a highly stable permeability tuned VFO, a cathode follower, voltage regulator and the required control circuitry to permit reception and transmission, or both transmission and reception on a frequency removed from the VFO setting of the transceiver. This operation must take place in the same band to which the transceiver is tuned. The unit is housed in a cabinet which matches the TR-3 or TR-4 transceiver and contains a five inch 4 ohm speaker. 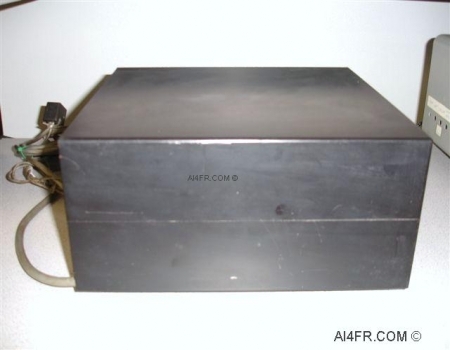 An AC-4 (or AC-3) power supply can also be housed inside this cabinet. 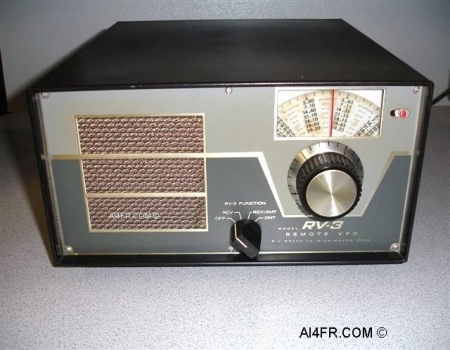 The operation of the RV-3 is straight forward and simple consisting of only two controls. 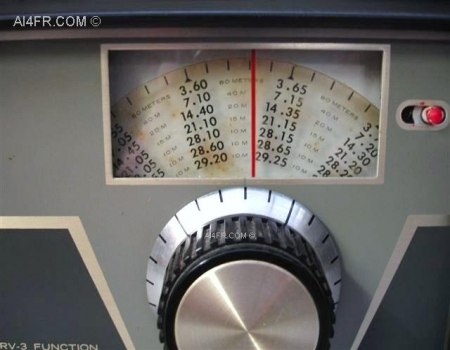 A main tuning dial that determines the frequency of the VFO and a four function control switch to select between On/Off, Receiver, Receiver/Transmitter and Transmitter. In the picture on the right, the small red knob in the upper right corner is known as a fiduciary control and allows the operator to zero in the main tuning dial so the correct frequency is displayed. The dimensions of this item with out the added power supply is 5 3/8" high by 10 3/4" wide by 11 1/8" deep and weighs in at 6 1/2 pounds. 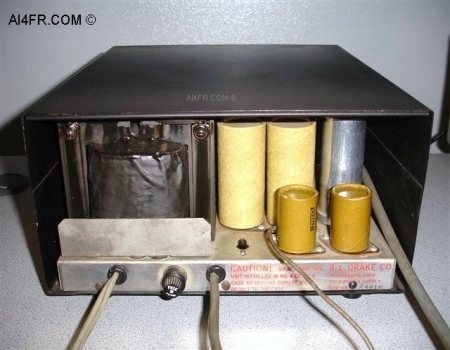 The AC-3 power supply option has been added to the example on this page. The photograph on the left is a close up of the four function control switch as well as the front markings on the RV-3. The four function control switch allows the operator to select between, On/Off, Receiver, Receiver/Transmitter and Transmitter. The photograph on the right is a picture of the left side of the RV-3. The photograph on the left is a picture of the back of the RV-3 and shows the AC-3 power supply installed. The photograph on the right is a close up of the markings that are found on the rear of the power supply unit. Starting with the text at the left it reads as follows, "CAUTION! Do not ship this unit installed in MS-4 or RV-4 case as serious damage will result to the case." The text on the right reads as follows, "R.L. 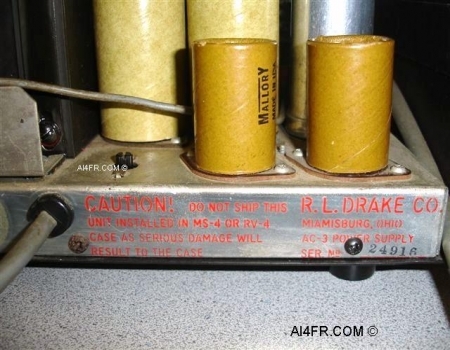 DRAKE Co. Miamisburg, Ohio AC-3 power supply Ser. No 24916".